“An enchanting harmony of fuchsia, purple and pink undertones, Radiant Orchid inspires confidence and emanates great joy, love and health.” Leatrice Eiseman, executive director of the Pantone Color Institute. Each year, Pantone carefully selects a group of colors that best represent current trends. 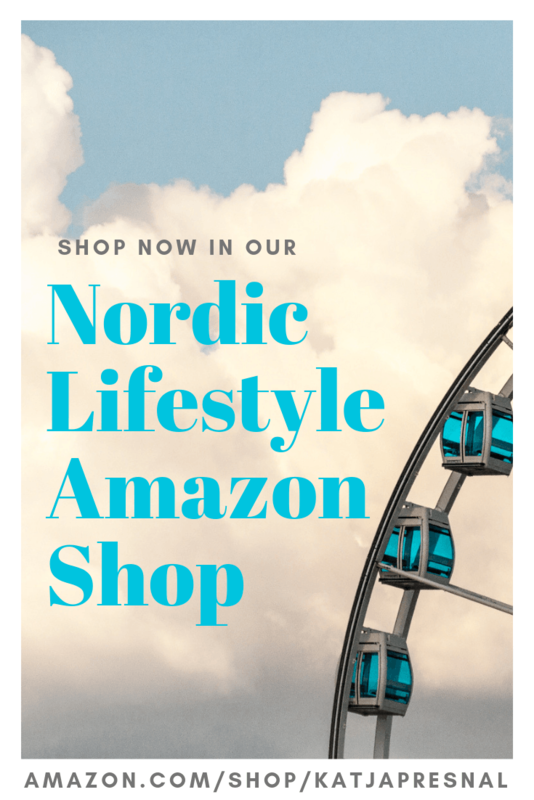 Pantone researches the entertainment industry, traveling art collections, current street styles, technology, up-and-coming popular travel destinations, and even current sporting events to come up with the colors predicted to make the biggest splash and most impact for the coming year. One color is then selected among the group as a stand out and Pantone’s Color of the Year. This year, it’s Radiant Orchid, a stunning pink and purple shade that has been showing up in everything from shimmering eye shadows to sporty sneakers. 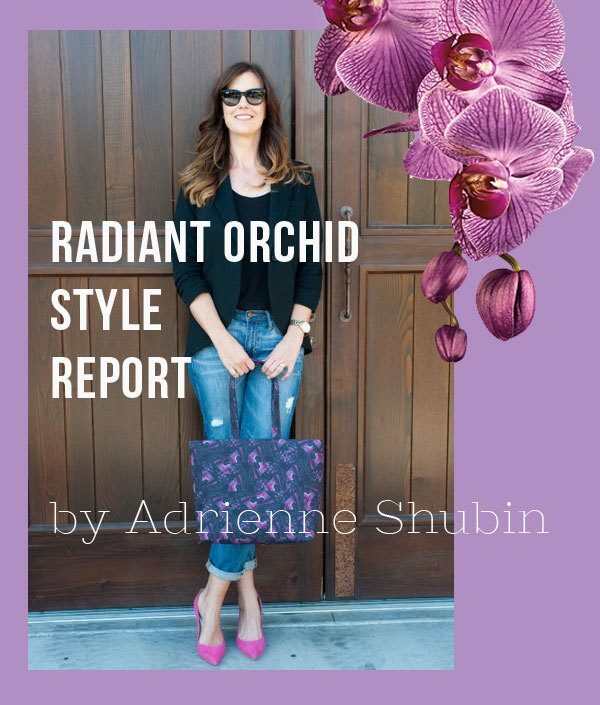 Radiant Orchid can liven up the most basic of outfits. Here, a neutral look of black and denim gets a colorful boost with the addition of these eye-catching pumps by Ivanka Trump and a chic Sylvia Steininger tote. Constructed with an original textile design featuring various shades of purple and fuchsia against a black background, this tote is a subtle yet versatile way to use Radiant Orchid. Radiant Orchid doesn’t have to translate as a single hue. 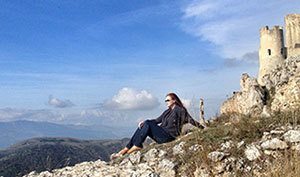 Variations of the color in pinks and purples from deep plums to vivid fuchsias are seen in all types of clothing and accessories. Here, two variations of the color are used in this monochromatic look, appropriate for a date-night or an event such as a wedding or fundraiser. 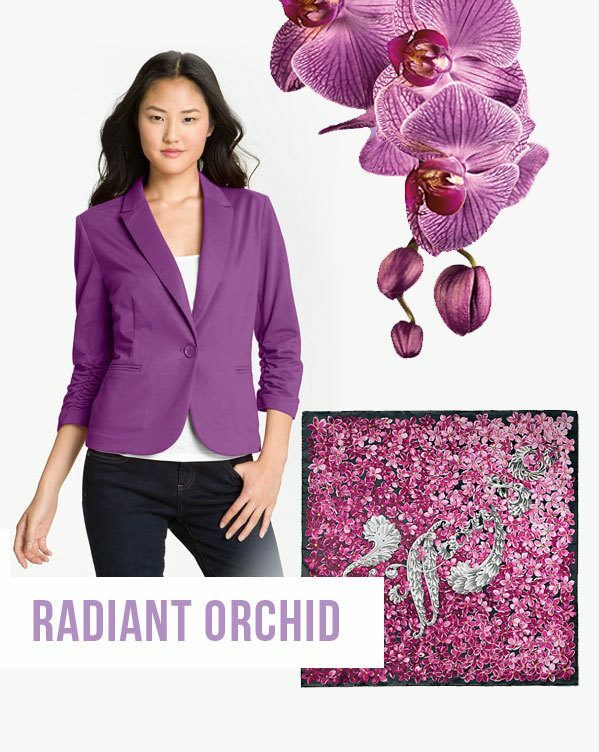 Add a blazer in Radiant Orchid to your wardrobe to wear with jeans for a night out with girlfriends or to work with a pencil skirt. Tie on a silk scarf in Radiant Orchid, to add even more rich color and some fun texture. Rainy days don’t have to mean boring black and khaki. 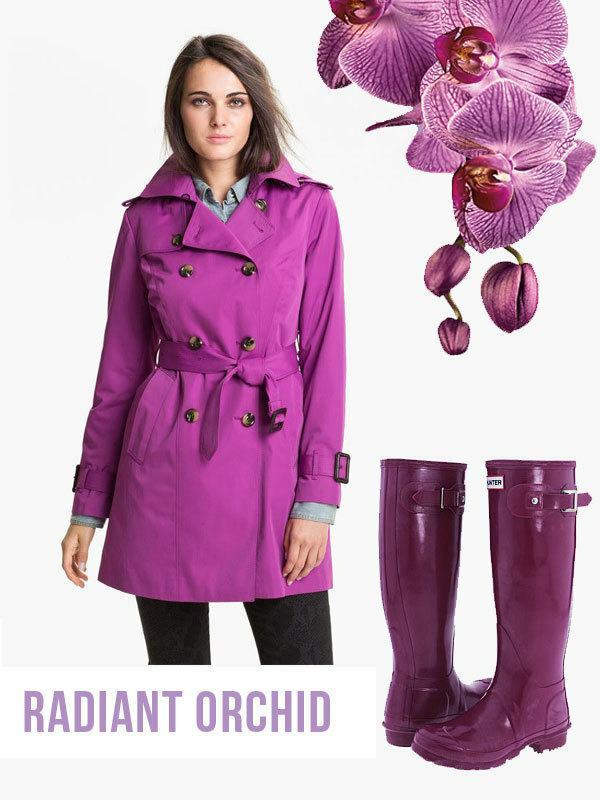 Why not cheer up a damp and gray day with a Radiant Orchid trench and boldly colored purple Hunter rain boots? You’ll be dancing in the rain! 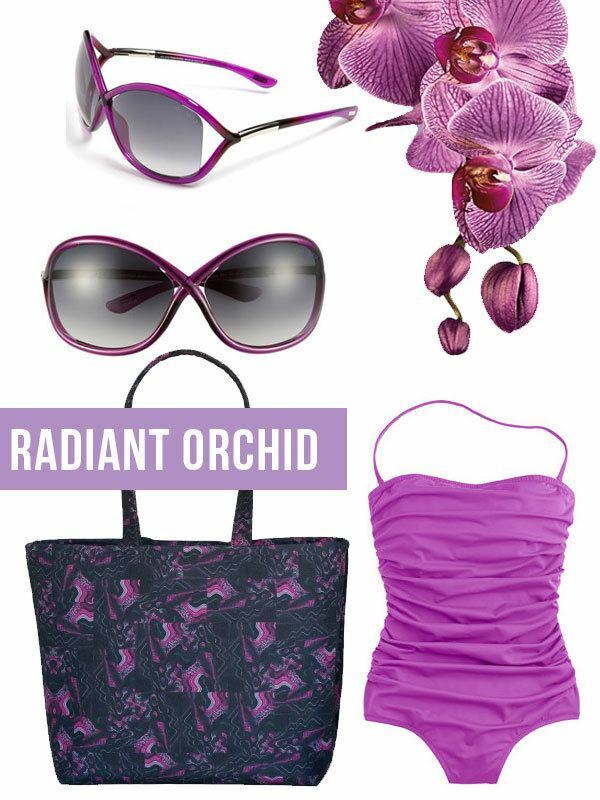 When the sun comes out, head to the beach with Radiant Orchid sunglasses and a dazzling ruched one-piece swimsuit. Keep your magazines, iPad, water bottle, sunscreen and cover-up in a roomy Sylvia Steininger Tote. 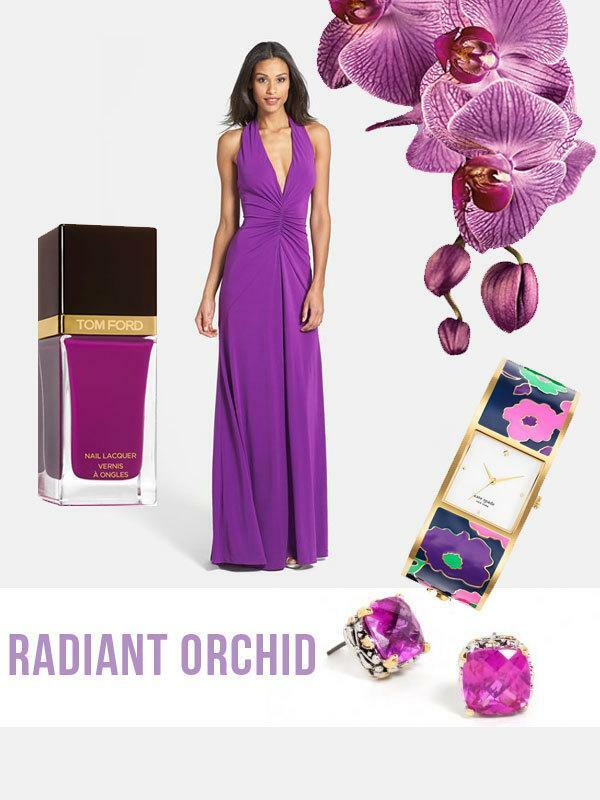 Turn every head in the room at your next formal event in Radiant Orchid with this halter gown. A color that blends both warm and cool hues, Radiant Orchid brightens up the complexion of those who wear it and flatters most hair colors and skin tones. If wearing big doses of Radiant Orchid is not your style, try smaller additions to your outfit like stud earrings in a rosy fuchsia, brilliant purple nail polish or a floral patterned bracelet watch with complementary shades of Radiant Orchid. Are you wearing Radiant Orchid this year? What’s your favorite way to wear the Color of the Year? I think a smaller pop of radiant orchid will be better on me so I’ll be sporting it on my toes and possible in a scarf I wrap a handbag handle with. Wonderful piece Adrienne!!! I spy my favourite wellies there. Maybe I need the trench coat to go with it. This is such a lovely colour! I love everything, purple is my favorite color and I am so thrilled that they picked radiant orchid for the color of the year! Great picks. I think that worn as an accent or near the face it definitely lifts the complexion and i think it is one of the few colors flexible and suitable to most coloring. I think you look absolutely gorgeous in the color! I LOVE the trench coat! !